Today’s pattern release is a little out-of-the-norm for me. If you’re expecting a bundle of joy soon, or if you work with (or sell to) photographers, you might love it! With the arrival of Baby Boy #3 less than 2 months away, I’m starting to think about what I want to do for his newborn photo session. I didn’t even know how to crochet when my two older (now 4 & 6) boys were born, so this is exciting! I’m a big fan of the rustic-modern style, so I’ll definitely be incorporating that into the photos. I saw this pin on Pinterest not long ago and decided that a chalkboard crate was the way to go. I figured I’d have to DIY it, so I was really happy when I came across a baby-sized crate at Walmart that already had the chalkboard section built in. It doesn’t get much easier than that! 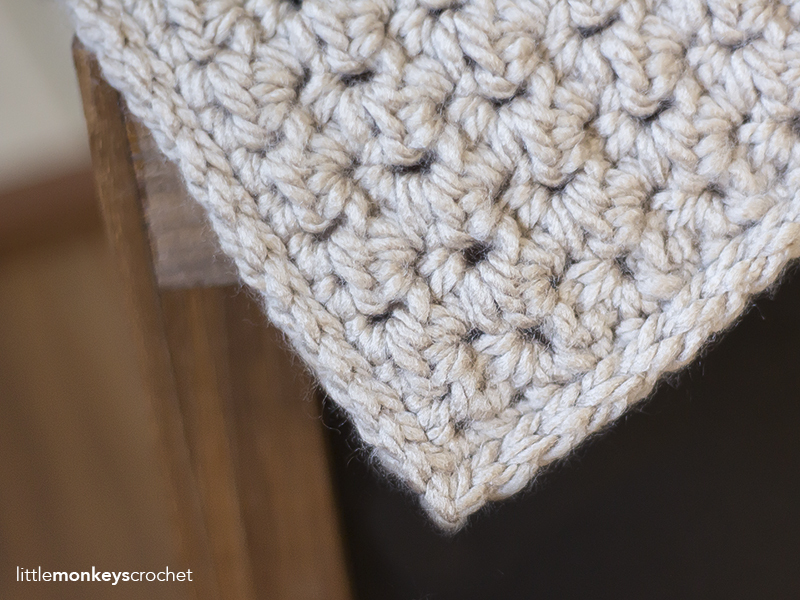 I decided to crochet a few fluffy blankets for the crate, and have been keeping my eyes open for the perfect yarns to achieve the cozy rustic look I want. I ended up choosing three different yarns, and whipped up some of the coziest looking prop blankets ever! These yarns are all different brands, but their colors and textures will work beautifully together or separately. As you’ll see below, this pattern isn’t written out as a pattern so much as it is a formula, because it can work for any yarn and any hook size you choose. 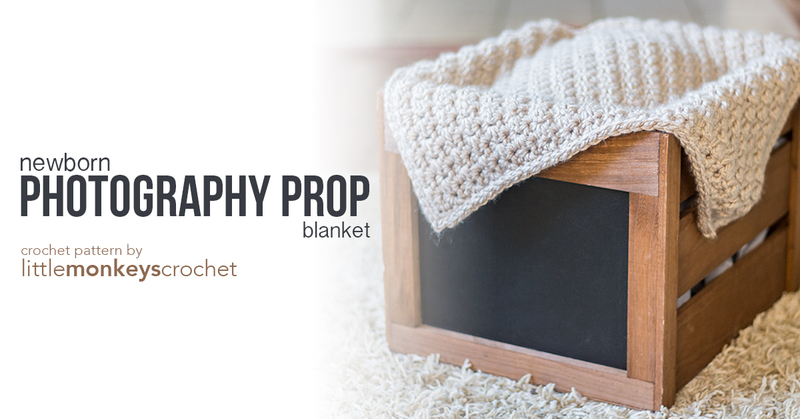 So instead of giving you detailed chain and stitch counts, I’ll teach you how to determine the right number of stitches for the yarn you choose, to get a beautiful 20″ x 20″ prop-sized blanket. This is not a beginner yarn, but I will say that this pattern is ideal for it. The crinkly texture of the yarn makes seeing your stitches tough, but the stitch combination we’re using makes it easy to feel where the hook gets inserted, thanks to the little holes that are created when we skip a stitch and put two stitches together in the next. The resulting blanket is really rustic looking. I’d never noticed this yarn at the store before, but when I saw it at Joann Fabrics, I knew it was absolutely perfect for the look I wanted to achieve. Home Bundle is a supersized skein of 4 different textures of yarn: a faux-fur, Bernat Blanket, a regular super bulky yarn, and a yarn that feels really similar to Lion Brand Homespun. These textures show up in a self-striping pattern, and I did see a few colorways that featured different colors for each texture, but I opted for the all-cream skein because I didn’t want the jagged edges that come with abrupt color changes (which would be especially noticeable in this thick of a yarn). The resulting blanket is incredibly soft and looks just like something you’d want to snuggle around your newborn. The color of this yarn is gorgeous! I’m always a sucker for really natural-looking neutral yarns, and this is a good one. This is the yarn that shows off the actual pattern the best of the three that I chose. I also opted to put a simple, boy-friendly (i.e. not frilly) border on this one, and included the instructions for it in the pattern below. Scroll down for the free pattern! Do not resell the pattern, altered or in its original form. Do not pull any of my photos from this site (or any of my other sites) for your own use. The exception to this is if you want to share my article link(s) on your own blog; in this case, you are welcome to take one photo per post for use on your site as long as it is accompanied by a direct link back to my post. A NOTE ABOUT PRINTING: My patterns no longer show up when accessed via PrintFriendly.com. (This is out of my control; please see my FAQs for more info.) If you wish to print this pattern (for personal use only), you can copy & paste it into a text editing document, or purchase the inexpensive PDF (see pattern info, below). Click here to purchase an inexpensive, ad-free PDF version from the Little Monkeys Pattern Store. Or, purchase an All-Access Pass to get unlimited access to all of my ad-free PDFs! (1) This pattern is written in American Standard Terms. (2) Starting CHs do not count as stitches. (3) This pattern will work for any size blanket and you can chain any number to start as long as it's an odd number. Being sure to chain an odd number of chains, chain until your starting chain is about 19-20" in length. Row 1: SC+HDC in 3rd CH from hook. (SK next ST, SC+HDC in next ST) across. Row 2: CH1, turn. SK first ST, SC+HDC in next ST. (SK next ST, SC+HDC in next ST) across. Repeat Row 2 until your blanket measures about 20" in length. Fasten off and weave in ends, or continue on to Optional Edging, below. Round 1: CH1, turn. SC evenly around the entire blanket, putting 3SC in each corner. (On the sides of the blanket where there aren't already defined stitches, you can put 1SC in each row.) Join to the first SC with a SL ST. Round 2: CH1. SL ST in each SC around the entire blanket, putting (SL ST, CH1, SL ST) in each corner stitch. Join to the first SL ST with a SL ST. This is a FREE pattern, and by using it, you’re agreeing to the following legally-protected conditions. Do not copy and paste the pattern onto your own blog, in a Facebook group, or anywhere else. Simply link to this page instead. Anything beyond this is copyright theft. You are welcome to copy/paste it into a document for printing, for personal use only. Do not pull any of my photos from this site (or any of my other sites) to promote yourself or your crochet business on your own blog, Facebook page, or anywhere else. The exception to this is if you want to share my article link(s) on your own blog; in this case, you are welcome to take one photo per post for use on your site as long as it is accompanied by a direct link back to my post and does not include any portion of the pattern itself. Do not post a translation of the pattern anywhere – this is copyright theft. If you would like to help make a translation available, I am happy to publish it on my blog with a link to your blog or Crochet-related Facebook page. Do not make a video tutorial of this pattern (or any of my patterns). For a detailed explanation of why this hurts designers, please contact me. I welcome all comments and questions as long as they are spoken with kindness, and I will always try to extend the same respect to you with my replies. If I feel your comment is inappropriate or unnecessarily hurtful, it may be deleted at my discretion. Congratulations on #3 boy I had three boys. I love the pattern and will try it soon. I had a request from my church to make some lovies to be give out to small children when needed. Yesterday I purchased some Bernat Baby Blanket Yarn, I think your pattern is perfect for this project. Thank you for sharing, great timing. Best wishes for the new baby, we have three sons. This is an amazingly simple pattern and I am using it now to make my sons blanket, I’m just doing the colored blocks tutorial for the other textured blanket you have on your blog! Now I know which border I’ll be using for it too…this border will be awesome! Thanks! I'm Rebecca, a wife, mom, and tryer-of-new-crafty-things. I love to crochet, and I try to design patterns that the younger generations will love to make and love to wear. You can get to know me a little more here!